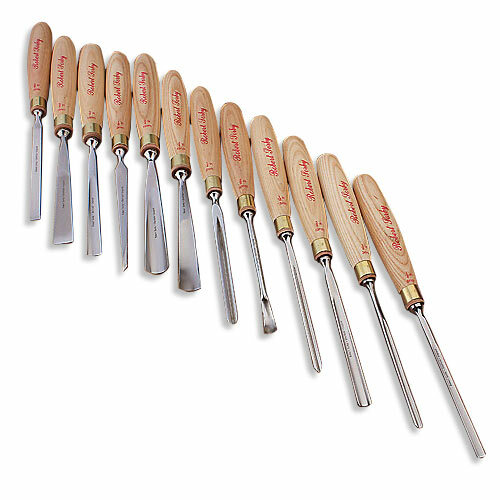 Ready to invest in fine carving tools? You'll find these sets tough to beat. They start with the single piece blades, which are hand forged from a special Sheffield alloy, then heat treated to ensure the best edge retention, and, finally, are honed and polished to razor sharpness. The handles are comfortably shaped and polished from resilient ash and can be used either by hand or with a mallet. To give the user instant tool recognition the brass ferules are stamped with the pattern number according to "Sheffield List", while the handles are marked with the blade width (both inches and millimeters). Tools are fitted with a shock absorbing leather washer. 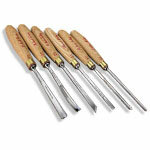 Tools have an overall length of approximately 10" to 10-1/2" England NOTE: Both the 6 Pc. and 12 Pc. Sets are exclusive to each other. No tool is repeated in the opposite set. 12 Pc. Set: Includes a 3/8" Square Chisel (#6001); 1/8" Skew (#6002); 1/4" & 3/4" Straight Gouges (#6004); 1/8" & 1/2" Straight Gouges (#6005); 3/8" Straight Gouge (#6006); 3/4" Straight Gouge (#6008); 1/16" Veining Tool (#6011); 3/4" Bent Gouge (#6014); 3/8" Spoon Gouge (#6027); and a 1/4" V-Parting Tool (#6039). An expanded set of tools meant to address a wide range of carving needs.